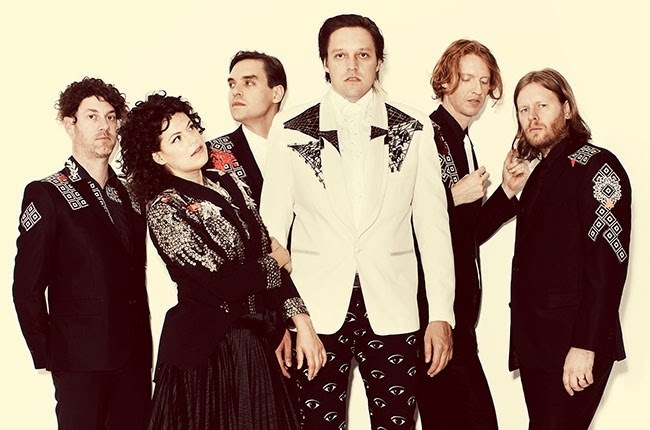 Canadian indie rock heroes Arcade Fire on Tuesday snagged a field-leading six nominations for the Junos, Canada's top music awards. Crooner Michael Bublé and Serena Ryder are each up for five noms, while Céline Dion, Drake, Hedley, and Tegan and Sara earned another four nominations each. Arcade Fire's "Reflektor" will challenge for single of the year against "Closer," by Calgary-raised duo Tegan and Sera, Ryder's "What I Wouldn't Do," Bublé's "It's a Beautiful Day" and "Inner Ninja," by Classified and David Myles. Nominations for the Junos were unveiled during a press conference on Tuesday in Toronto. Arcade Fire in 2012 won four Junos, including best album and best group, and is expected to dominate the Canadian music awards again this year. The Montreal rockers will also challenge in the album of the year competition this year with Reflektor,against Ryder's Harmony, Dion's Loved Me Back to Life, Drake's Nothing Was the Same and Bublé's To Be Loved. And the Juno Fan Choice Award category will be fought over by Arcade Fire, Justin Bieber, Avril Lavigne, Bublé, Ryder, Dion, Drake, Hedley, Robin Thicke and Walk Off the Earth. Thicke was also added Tuesday to the performers lineup at the 2014 Juno Awards, alongside City and Colour, Ryder, Tegan and Sara and Walk off the Earth. The Junos, organized by the Canadian Academy of Recording Arts and Sciences, will be handed out on March 30 in Winnipeg, Manitoba, and will air live on the CTV network. This article first appeared on THR.com. Check out select awards below. See a complete list here.